We added additions to our robot in order to create an easier and more efficient driving environment. We have placed a blue LED strip on the back of the hood to let drivers know whether or not they are in a good shooting proximity. To do so, we wired up MOSFETS to control the LED strip, which will plug into the DIO port on the roborio. At SFR, we found that installing “back-up cameras” would help with gear placement. Therefore, we worked on optimizing the camera placement, as well as finding a way to widen the narrow field of view (currently 70 degrees) to better capture the gear’s location. After the post-mortem we worked to improve the robot's turning during autonomous. We prototyped small Delrin sliders that didn't quite work when sliding on carpet. 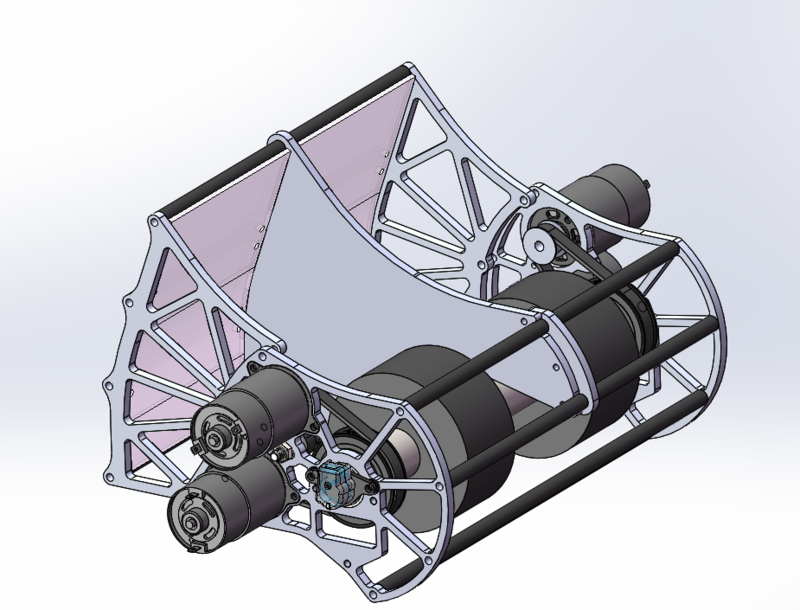 We anticipate that the best solution will be to try to implement drop-down omni wheels that we can turn on. However, if that does not work either we will resort to changing the autonomous routine itself. Today, we worked on fixing the intake after it broke earlier this week. After analyzing the strength of our current weldment and modifying it slightly, we decided that simply strengthening it would not help the fundamental problems existing in the design. We took one of the broken intakes and attached it to new polycarb side plates hoping that this would decrease impact forces by increasing the time of impact (change in momentum = force * time). We drove around and crashed the intake several times with minimal damage occurring, and we are proceeding with the new design. Today, we worked on the Hopper and testing the fully assembled redesign. After fixing some initial discrepancies in the real life assembly, we tested out deployment and stowing. As of a few tests, the intake deployed well (after modifying the intake ramp slightly to have slightly deeper notches to fit the constraint screws in) and we will be updating the CAD with these changes on Friday. We will also laser cut a new intake ramp to get definitive results. If all systems work well after that, we will begin assembling the new parts for comp as well as a back up. Between, Friday and Saturday, we were able to finalize the hopper design. After some CAD work on the redesign and some troubleshooting after assembly, we were able to make a solid hopper. More testing will continue to confirm consistency, but we will be moving forward with the Comp set soon. In the last week, we explored the use of a large flywheel to help increase the consistency of the shooter. A flywheel dramatically increases the kinetic energy of the shooter wheel system, hopefully reducing the amount that the wheel slows between shots. We designed a steel flywheel with about 4 lb*in2 of inertia. It is geared up 2.5:1 from the shooter wheel to increase the kinetic energy. Preliminary testing shows that adding the flywheel may not actually achieve the desired result. The elasticity of the timing belt caused some controllability challenges that the programming team worked on this weekend. Each time the direction of tension in the belt switched (from energy going into the flywheel to energy leaving the flywheel), there was a little bit of elastic movement which added oscillations to the shooter wheel system. The plots looked like the typical mass/spring/damper plots for a 2nd order system from a controls or dynamics class. We are using inline elastic to add stretch to the rope. 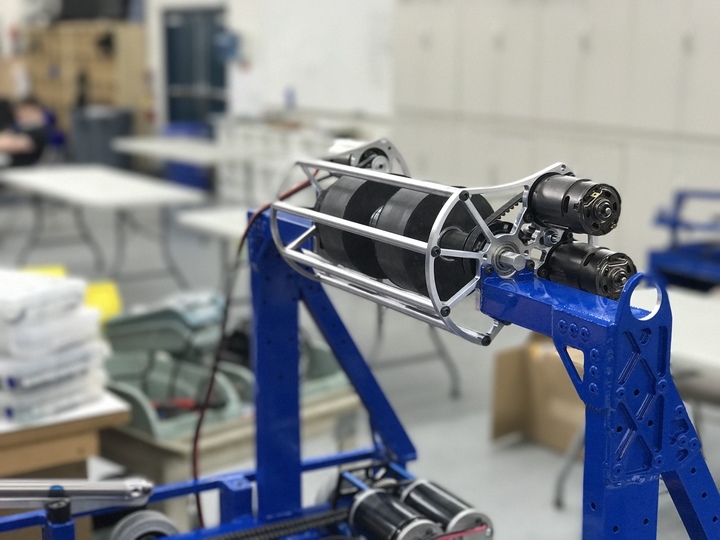 This will allow the robot to pull the rope down with a low amount of force at first, getting some wrap before beginning to lift the robot off the ground. This is important because the Velcro that engages the climber drum is strong in shear – and its strength is proportional to surface area. Once the rope has wrapped around the drum enough, the load transfer switches to Capstan forces. We are assembling several ropes, each with a number of pockets like the ones shown below. A video is linked below of the climber being tested. Note that in this test case, we were pulsing the motors. Typically, the climb is much faster. The latest iteration of the gear grabber has a dual pivot design – the whole mechanism pivots from a pickup configuration to a scoring configuration with one pivot, and a second lower pivot is sprung to allow the wedge to conform to the floor without digging in. We built this prototype last week out of delrin on the laser cutter and used it for driver practice over the weekend. We moved forward with making this out of metal and sent the parts to Anodize on Monday morning. We practiced driving by cycling gears with and without defense, climbing, and intaking balls off the floor. We are much better now at quickly scoring gears, and in one practice match we scored 9 gears and climbed when no defense was played on us. The gear grabber is much more reliable, and consistently picks up gears off the ground the second we touch them. Scoring is still tricky, but we are getting better at finding the right depth at which we need to drive into the spring. Today, we worked on finding and fixing a bug in our Adaptive Pure Pursuit controller. The bug was causing arc lengths in the controller to be calculated incorrectly in some cases, resulting in a value much higher than it should have been. This would in turn cause the robot to drive way too fast and shoot past the end point in the path. Today, we worked on implementing a new Gear Grabber state machine. The new gear grabber code greatly simplifies the operator controls. Now, there are only 2 buttons used for intake and release. The state machine uses output current to determine when a gear has been picked up and will activate the piston automatically. We also found two bugs resulting in the robot not turning left and twisting along an autonomous routine, and we were able to fix these edge cases. 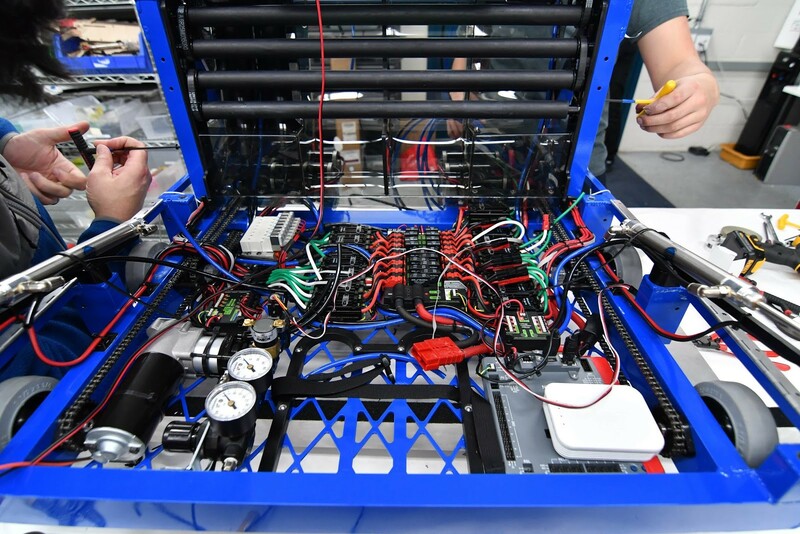 The hardware team began crimping and attaching 15 battery leads and running battery tests to determine true battery capacity. Today we ordered all the the parts for the upper extension of the hopper floor and got majority of the CAD done. We will be going with 50 degree edges made out of Delrin with the first two rollers of the upper extension not having any surgical tubing to allow for horizontal movement. We worked on the gear grabber. We removed the polyurethane added before with black, conforming WCP wheels. We found them to work significantly better than the polyurethane, but still not extremely well. We continued to work and changed the WCP wheels to red conforming wheels, which while ugly, worked better. We worked with the drivers over the weekend, doing basic drills like gear cycling, in order to become accustomed to driving the robot prior to the SFR Competition. We started the day by iterating on the floor for the gear grabber. The floor pickup for gears still needs work as it is inconsistent at picking up the gears when we drive into them. The polycarbonate knife edge was not as smooth as the prototype. There was a small edge on the actual version which was causing problems, so we sharpened it. After iterating on it, we then mounted it, and set ourselves on solving the jackknifing. We realized the best solution for this would be to redesign it, so Andrew and Mani are working on a new CAD. Meanwhile, the group worked on iterating on the length of the polycarb. We still have work to do before we finalize the design. The major problem we were trying to solve was that the bumpers were too low. This was because the mounting solution uses C-channel brackets that go around the bumper supports and are supposed to sit flush to the underside of the little 1/2 x 1/2 bumper rail. But, what we didn’t realize is that the rail actually has a weld bead under it so the brackets could not go up high enough. This made the bumpers too low to the ground. To fix this, we removed a couple staples and pulled back just a bit of fabric on one of the practice bumpers so we could remove the brackets without actually remaking the entire bumper. We used the mill to make the brackets shorter, so they can move up and avoid the weld. We also used the drill press to add a new hole so they can align to the holes already drilled in the robot. This works pretty well, but some concerns are that the bumper is now too high and lifting the intake up, preventing it from going down far enough to have good compression on the balls. As of now, the intake is working fine. We still need to mill down all the other brackets, and we talked about making new ones and getting them anodized for the competition bumpers. The red comp bumper still needs fabric, and the blue one should have the fabric removed. Over this weekend, we worked on the hopper redesign. After some initial tests, we found that perhaps preventing the hopper from expanding sideways in the front expansion might add rigidity and strength to the hopper. To do this, we tested by bolting the front sliders to the hopper to prevent them from sliding. After testing, however, we found that intake by actuating the field hopper became difficult as the decreased width of the hopper prevented the balls from coming into the robot. To accommodate this, we redesigned the hopper in CAD so that the top will slide out vertically while the bottom pivots about a fixed point that torques the flexible polycarbonate. 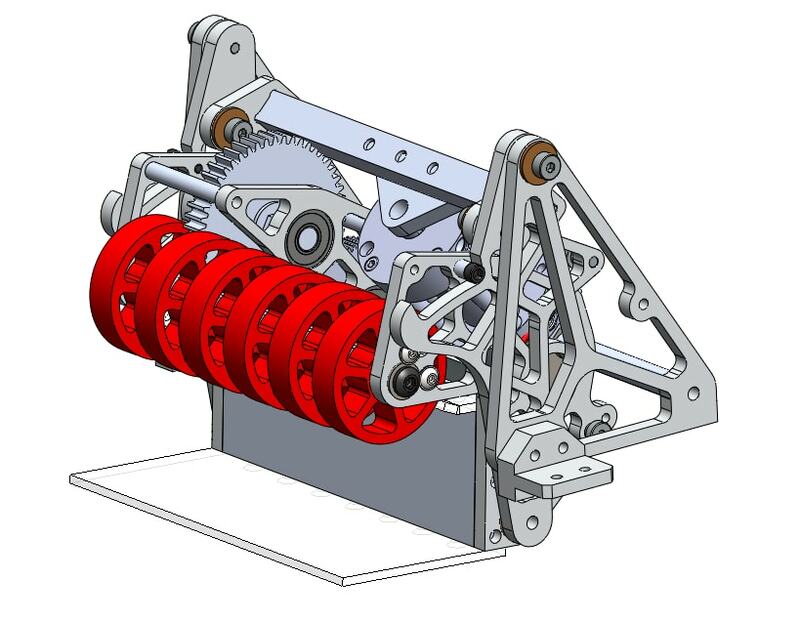 We also started the CAD of the new hopper floor for SFR which has the top rollers and wedges and a center to increase our ball throughput. We started the construction of the wedges on the hopper floor. 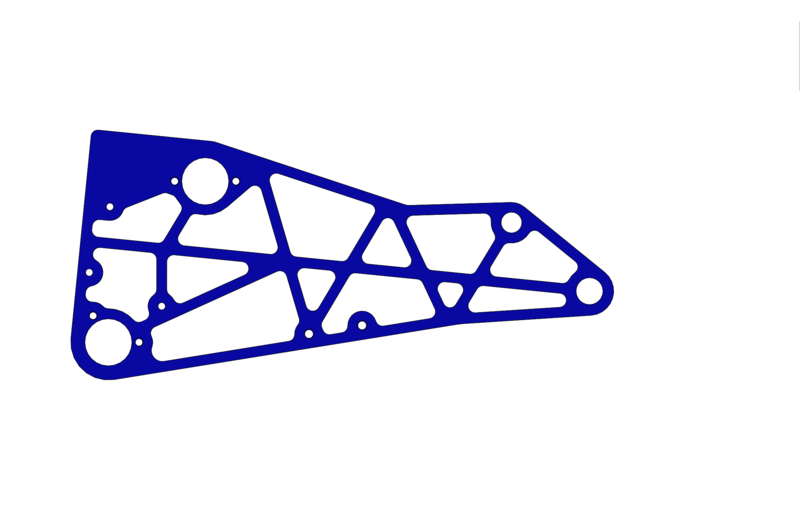 After some brief testing, we CAD-ed this out. We will begin manufacturing on Monday. 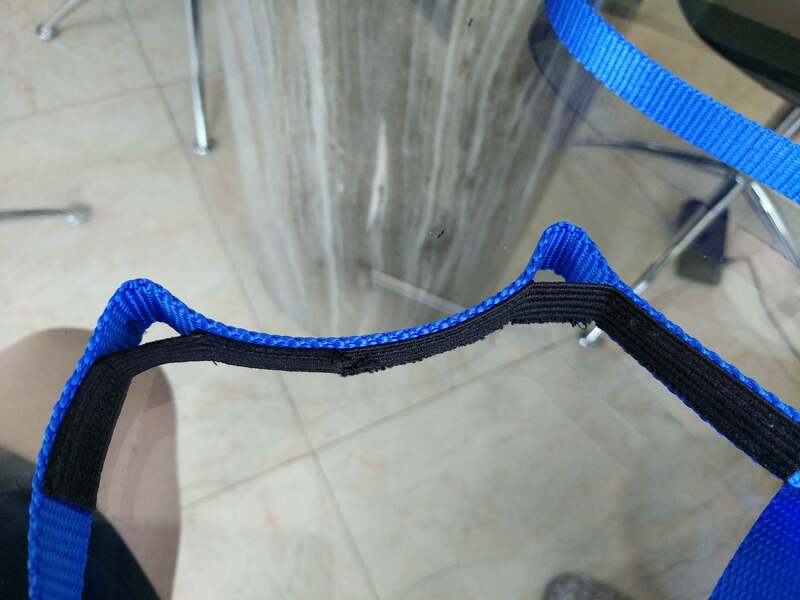 This weekend, we received the 3/4” ratchet strap climbing ropes with the sewed on velcro. We tested it by pulling on it and rubbing it at corners in order to see distressing. The rope was then tested using the rope climber on the practice robot but the lack of stretch/slack made it hard to latch onto. In the near future, the rope team will attempt to plan out elastic placement on the rope. We wired up a MOSFET to control the switching of the LED light, located on the front of the robot, by having a voltage signal sent out from the relay port of the Roborio. It allows the drivers to see better when having to place a gear without the light blinding them. Today, we worked on creating a reliable 40 kPA autonomous mode. We decided that previous autonomous modes that used complicated S curves to swerve into the hopper were too inconsistent, so we settled for a new, much simpler mode. But, at the end of the night, we had a working auto mode that deployed the intake, rammed into the hopper head on, waited a few seconds for balls to pour in, then aimed and fired the balls into the goal. We continued to improve the efficiency of this autonomous mode until we had it begin shooting around 6.3 seconds or less. We needed the autonomous mode to begin shooting as early as possible because there is around a 5 second delay between scoring a ball and having the scoring system pick it up. Because of this, any balls shot past 10 seconds will probably not be scored during auto. We continued revising our robot's autonomous routines, and we were able to drive to the hopper and trigger it, receive a payload of balls, and fire into the boiler. We also worked on a live data plotter that could plot robot data much faster than SmartDashboard. Various subsystems, such as the drivetrain, simply push data to a server, which pushes data to a grapher website on the driver station. This utility will be useful for tuning drivebase and shooter PID, as well as other programming tasks. Today, we worked on designing and testing the roller gear grabber. We installed a prototype onto the programming robot, and it worked somewhat well. When we drove into a gear directly, it was always ours, but it was narrow and difficult to always aim correctly at the gear. We played around with passive funneling, but were unable to significantly improve the width from which we can intake because of the sidewalls of the rollers were too low. 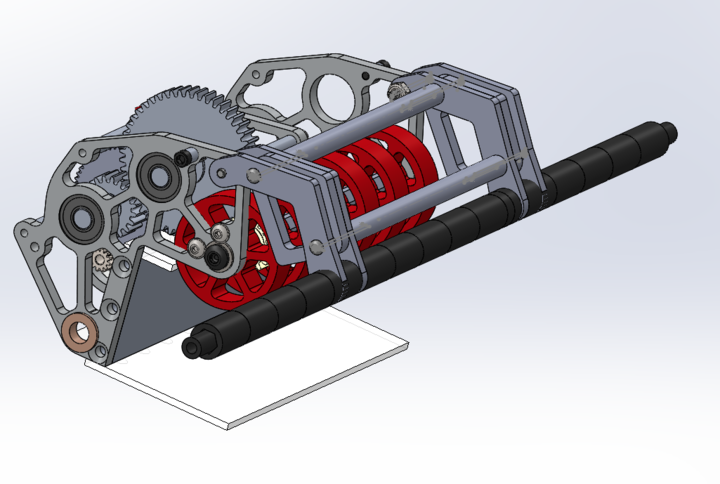 Griffin and Colin are currently designing a new gear grabber that will likely funnel more effectively, and we plan to have it on the robot and testing it on Friday. We took the top roller prototype that we have been working on, and added a center wall. The one from Monday was not long enough, so we extended it and stiffened it. We found this to help immensely. We also added zip ties across rollers to help the balls move across faster. We have reached a point where we are comfortable and confident with the floor. 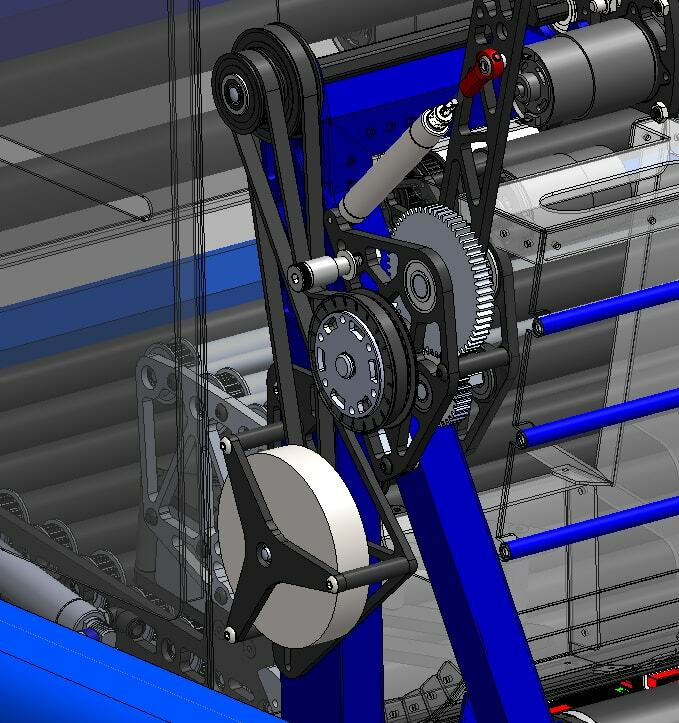 We made progress on the hopper improvements in CAD and the redesigned Gear Grabber. We determined the geometry for the gear intake, designed the gearbox, and made the basic assembly that will be developed upon later. Today, we worked on improving the web interface for the autonomous pathing tool. We improved the overall aesthetic of the app, and added several new features. These include the ability to see robot start and end rotation, and having the path colored based on the current speed of the robot. 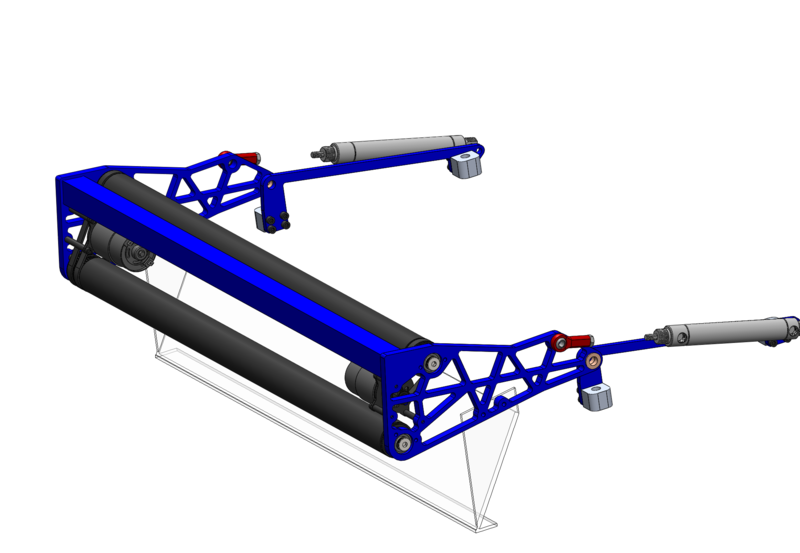 On Monday, we worked on making the hopper more rigid as well as tackling other issues with it, including breach of size constraints and inability to actuate field hopper. 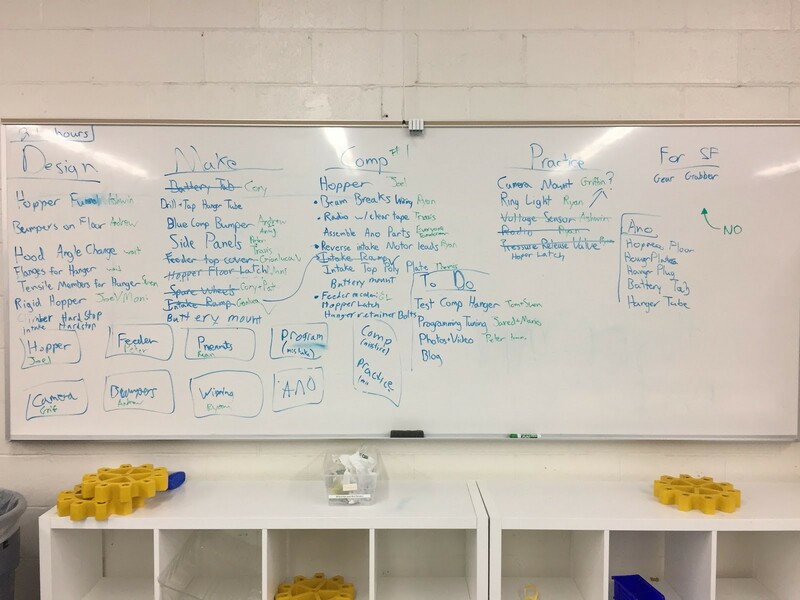 We brainstormed and tested off of current practice-bot hopper with small team to determine solutions. 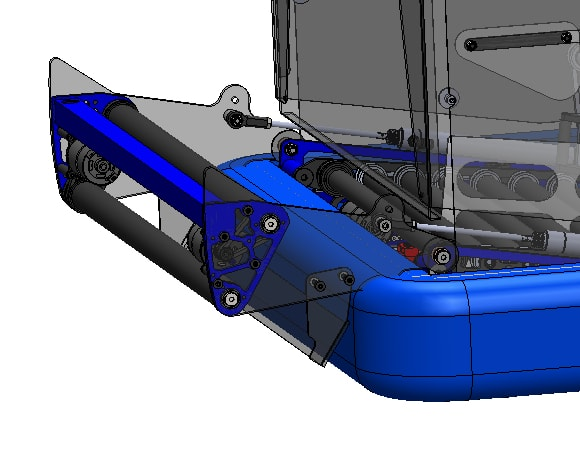 We plan to change the front extension components to prevent them from expanding sideways by making it one piece. 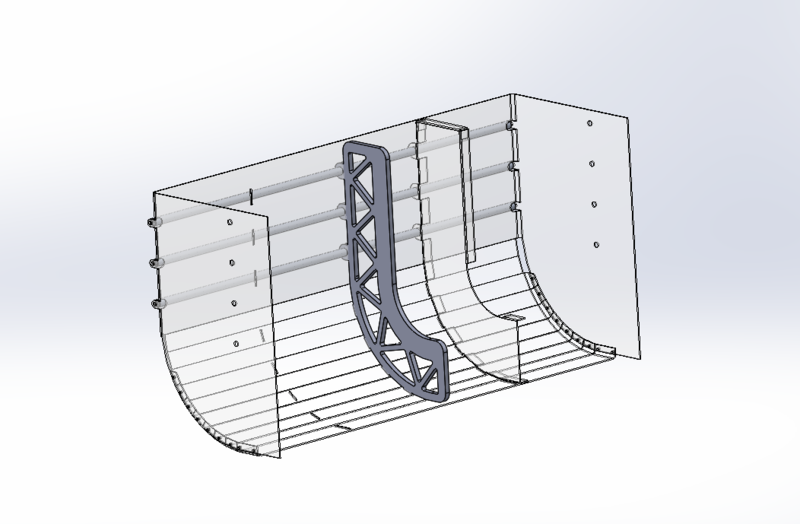 We will also lower the hopper to fold over the intake to give it greater strength and rigidity. As a result, the hopper will fold have slightly less volume for ball storage, but much greater strength. The rope design has been prototyped. The length and placement of velcro on the rope as well as the knot have been measured. The rope has not been tested or sewn on with velcro yet. Next build, we will attempt to prototype elastic and the placement of elastic on the rope as well as the amount. We constructed a new top roller for the hopper floor. We also made few wedges at different angles to see which angle was best in directing each ball towards the shooter. Once we find the ideal wedge angle, we tested it. It worked well during the first test, but it was not consistent. Next time, we should keep experimenting in order to find the proper wedge angle. We continued testing a ball counter for the shooter, but we were not able to count balls fast enough with the shooter on full power. For the counter, we’re using a Sharp distance sensor and creating a threshold that returns true when a ball is within range of the sensor. It is likely that our voltage threshold for the ball counter is too wide, causing some balls to not be detected. Today, we worked on solving the funneling speed issue by placing a set of 4 rollers at the end of the hopper floor and above the wedges to provide a force pushing the ball forwards. This worked extremely well as our output increased to around 10 balls per second. More work needs to be done with different wheels and friction surfaces on the rollers and wedges to further increase our output. We worked on pneumatically actuating the gear grabber by activating the solenoids individually. We are going to work on a state machine for Monday to make it more intuitive for drivers. We also deployed a sine scaling function to the driver inputs to significantly improve robot driving. We tuned the path following program by fixing some bugs and also investigated using the talon magic motion profile. We also developed the state machine for the gear grabber. 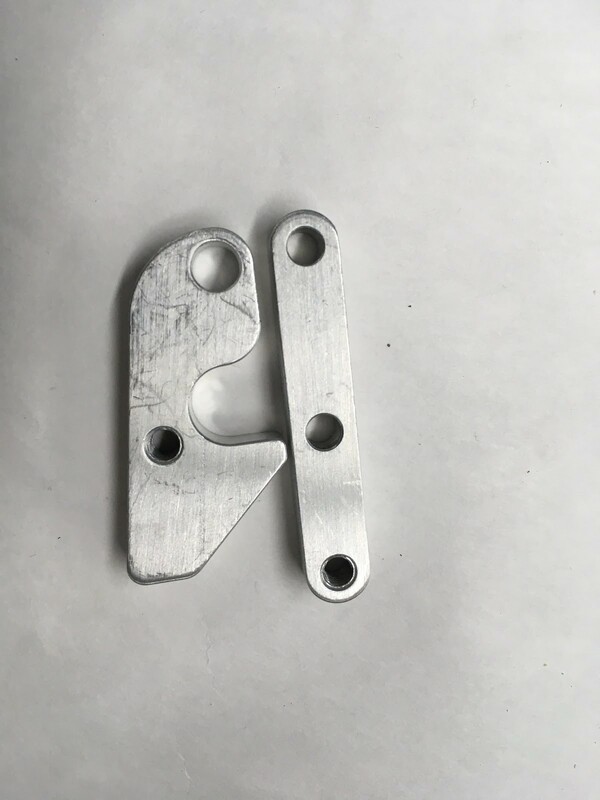 Today, we started by receiving news that after visiting 3 anodizing places, we could get parts for our hopper and hanger anodized for the competition robot. After calling, we knew that we would receive parts by 4, so we had to get everything ready for that time. The first thing we did was find every screw, every tool, every part, needed to assemble those subassemblies the moment they arrived. We then, finished the side panels and assembled the hopper. As soon as the parts arrived, we built up the entire robot and cleaned it, the best we could. We proceeded to take robot photos, and then diagnose the robot. We also spent majority of the day working on a battery tab mount to keep the battery leads away from the hopper floor. The battery tab mounts to the PDP and fastens the Andersons together. We found the shooter to have some issues that need to be dealt with, but physically fixing them must be pushed off until SFR. The robot was bagged around 10 minutes before 9pm. Yesterday, we worked on assembling and attaching the hopper container. 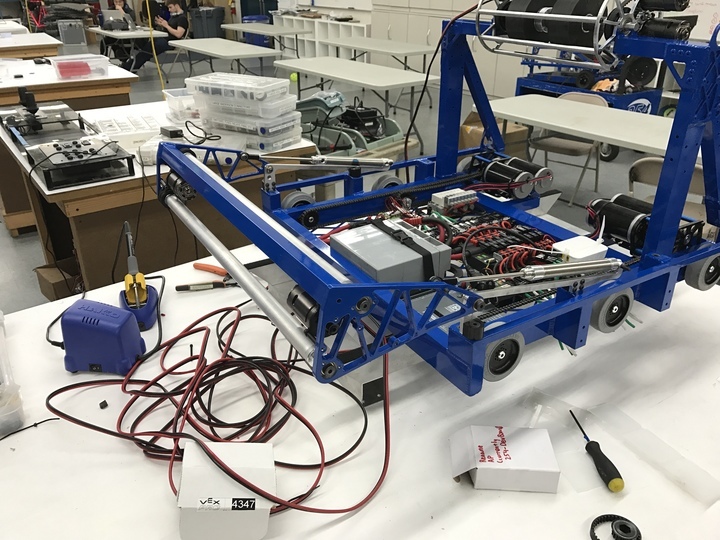 While we waited for the anodized parts for the hopper floor and climber to come in, a group of students worked on assembling the main components of the hopper while carefully avoiding smudging the sponsor side panels before pictures. After prepping everything and waiting for other subsystems to be assembled and attached, we riveted and bolted on the hopper in under 10 minutes to allow media time to take pictures and then carry out any final checks before bag and tag. Today, we worked on tuning our autonomous program some more. We discovered that the bug from yesterday was caused by two segments of the path not lining up, causing the pure pursuit controller to go out of control as it attempted to move the robot to the correct position. We managed to get a fully working autonomous mode that scored a gear, activated the hopper, then shot around 40 balls into the boiler. We noticed some inconsistencies with the gear scoring segment of the auto, most likely caused by wheel slippage. We didn't have enough time to fully resolve this issue, so we will continue to work on it this weekend. Today, we made sizable progress on the hopper. We made an initial prototype which we iterated upon to account for unforeseen difficulties. After getting it to deploy efficiently, we were able to store a max ball capacity of 140 balls. We are struggling with rigidity, however, as the 1/16 polycarbonate hopper flexes greatly when under stress from the balls and simultaneously driving. We will put aside fixing this problem for now as we have to finish putting together a robot for bag and tag. 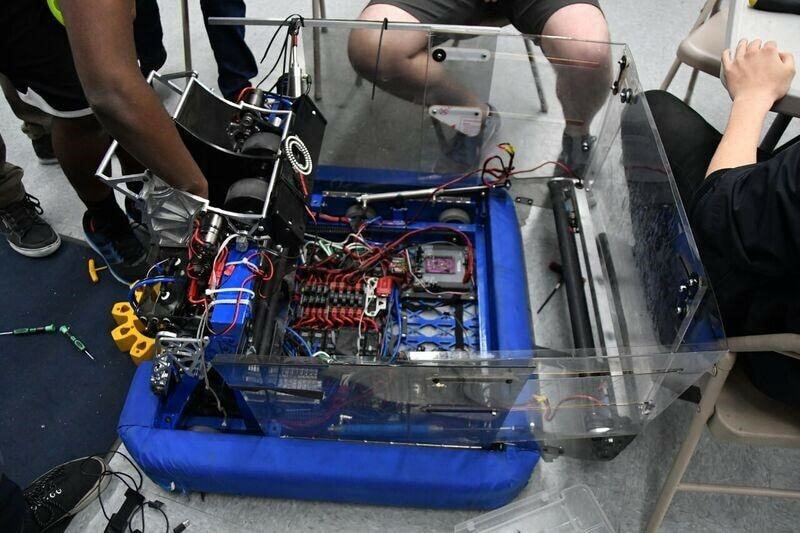 We have almost completed wiring on the practice robot. We are waiting on a few competition subsystems to be assembled then we will be moving on to pneumatics. Last night, we had the robot shooting a few balls. Once we finish the hopper, we should be able to practice driving. On Sunday build, we worked on a hopper gate latch to lock down the assembly during the match. Changes still have to be made to make the latch feasible. Today, we worked on assembling the hopper floor and finalizing it. We completely finished construction of the hopper floor. We worked on pneumatics and fixing the pneumatic tubing on the competition robot. We made progress on the side panels, which are coming along nicely. We also worked on general parts of the robot, but we still have a lot to do before tomorrow. Today, we worked on creating an updated version of the Waypoint maker app. This new app outputs java files to load on the robot. We also created a parser on the robot which converts these waypoints into path segments for the Adaptive Pure Pursuit Controller. Another project we worked on was implementing a turn in place autonomous action. We also made a couple auto paths to drop gears off and activate the hopper. We ran into some problems with motion profiling that we will fix tomorrow. We rewrote the TCP server which sends data about the robot state to a web interface to be graphed. We used a library found on GitHub to do this. Next time, we will incorporate this into the rest of the Robot code and test it with the roboRIO. We have almost completed wiring on the practice robot. We are waiting on a few competition subsystems to be assembled then we will be moving on to pneumatics. Last night, we had the robot shooting a few balls. Once we finish the hopper, we should be able to practice driving. The programming team finished vision tracking to auto-aim at the vision target on the goal. We assembled the hopper floor. The hopper floor originally had a .0010 nominal distance for the pulleys. After making the plates, we found that such a small distance caused too much tension, so we had to redesign it. We then, laser cut 5 different plates ranging from .0020 – .0060 of an inch.The .0060 of an inch measurement was the best way to go. Then, we put this measurement into the CAD and remachined those plates, which were put together. But, it was still too tight and required spacers in the standoffs. We put the spacers and it improved feeder consistency and reduced feeder tension. For the feeder, we had no way to service the 775’s due to very quick design restrictions, which would not be good at competition. So, we created holes on the side and top polycarb plates on the chute itself. Today, we worked to lock down the design of the climber for the robot. We will be using a winch which it connected to a power take-off from the shooter to use the 4x 775 pro motors there to climb. 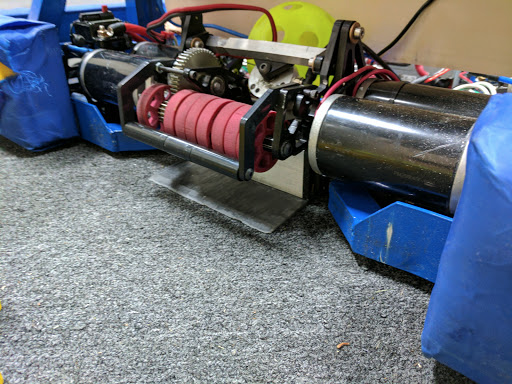 The winch starts stowed against the hood and is deployed by pneumatic cylinders to the perimeter of the robot size box after the start of the match. Note that there will be hard stops (rope or cable) so that the force of hanging does not pass through the pneumatic cylinders. The winch is connected to the shooter shaft with a hex coupler and a pulley which rides on a one-way bearing on a shoulder bolt. When the shooter spins in forward, the bearing will clutch. When the shooter reverses direction, the bearing will lock and drive the winch. Note that the shoulder bolt is left-hand threaded so that the torque of climbing tightens the bolt.  The total gear ratio is 25.7:1 from the 775pro motors. This should give an expected current draw of around 80 amps when climbing. The 12:36 reduction is in the shooter gearbox. The 18:36 reduction is the belt between the shooter and the climber gearbox. The 14:60 reduction lives in the climber gearbox (with a 30T direction-reversing idler gear) and the 1:1 reduction is the chain from the gear box to the winch spool. We plan to spool up a piece of velcro-coated webbing on a 1.25" diameter 1/8" wall thickness aluminum tube. FEA simulation shows that the expected bending on a 23" long tube of these dimensions should be around 1/16" in the middle (with purely elastic deformation). Work still needs to be done on detailing the right side support plates, and the drum. Today, we worked on building the bumpers for the robots. We made 4 bumper frames, secured pool noodles to the outside of all 4, and put sailcloth around 1. We will finish up the sailcloth tomorrow, and we plan to put on the team numbers soon as well. We assembled and began to test the existing gear mechanism with the "fingers", but it had a few flaws. 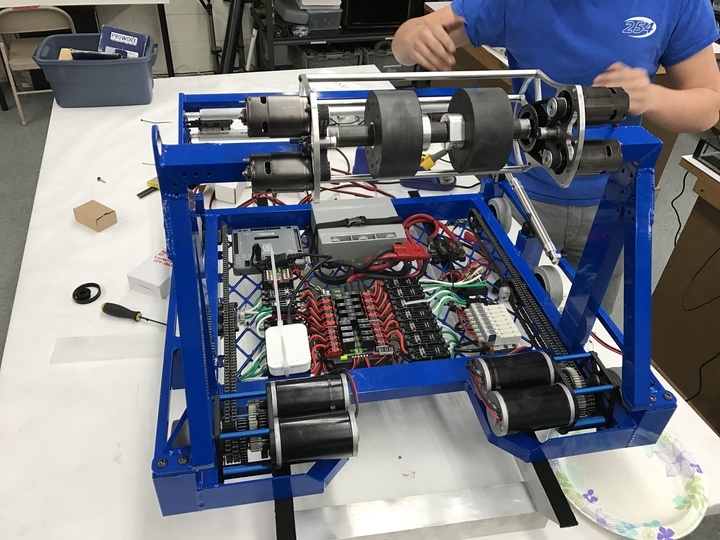 One group worked on fixing the existing gear grabber, while another prototyped another design using compliant wheels and a polycarbonate wedge on the bottom. The initial prototype was promising, but needed some work in order to be consistent. We plan to continue working on both tomorrow. We began integration of the autonomous path follower into the main framework of our code and began debugging the path follower. We discovered some issues but were able to solve most of them. Today’s biggest accomplishment was finalizing all the state machines for the Superstructure. Because of this, we were able to automatically detected the boiler goal, align to the boiler, and shooter balls towards it. This is a major step forward since we were able to integrate across multiple subsystems.